Honoring the victims of the USS Indianapolis disaster. It's considered the worst disaster in U.S. Naval History. 879 crew members died in the sinking of the USS Indianapolis in World War II. Five of those men were from Marion County, Tennessee and there will be an event honoring those men this Veterans Day. The Veterans Day Parade in Jasper is Saturday, November 11th. It begins at Betsy Pack Drive and will finish on Main Street. The parade will begin at 1 PM. At 3 PM there will be a presentation about the USS Indianapolis at the First Baptist Church in Jasper. The address for the church is 108 W. 3rd Street, Jasper TN. The USS Indianapolis delivered the components of the first atomic bomb that was dropped on Japan in World War II. On the way back from the mission The Indianapolis was hit by 2 torpedoes. There were 1,196 people on the ship. About 300 men died when the ship went down. The other roughly 900 were stranded at sea for more than four days. During that time some died from dehydration, and others were eaten by sharks or drowned. When they were resuced only 317 men survived. Rebecca Dalrymple's uncle Aulton Phillips was one of the sailors who was killed in the sinking of the USS Indianapolis. "Aulton was twenty-five," Rebecca said. "He was married with a three year old little boy,"
Rebecca has been hearing stories of her uncle most of her life. "This is a copy of the letter that Auton's wife received notifying her, you know, that he's missing in action," Rebecca said. When all of the photos, letters, and documents are not enough she turns to the people who knew him. Her aunt, Agnes Boggs, was Aulton's older sister. "When I found out that my brother was missing they came and told my daddy," Agnes said. "They came home to tell mama and my mother went in shock." Agnes says he joined the Navy at the same time her husband was drafted. She is now 102 years old. The USS Indianapolis was sunk 72 years ago, but Agnes remembers clearly how hard this was on her entire family. "Mama said, 'now I don't care for you going, but you're not gonna find what you're looking for," Agnes said. He never made that trip. He passed away just four years after his son was killed at sea. The event Saturday will honor Aulton Phillips, Jack Holloway, Ralph Harris Holloway, Thomas Jordan, and Clifford Owensby. 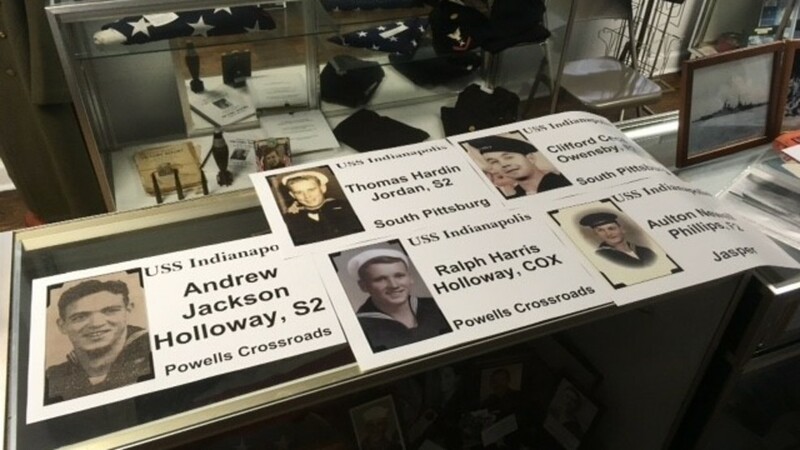 All five men were killed in the USS Indianapolis tragedy and all five were from Marion County, Tennessee. Of the 317 survivors of the sinking of the USS Indianapolis 18 are still living. Two of them live in the state of Tennessee including Kayo Erwin who lives in East Ridge near Chattanooga. We interviewed Mr. Erwin about his story in the summer of 2016.